Visit the New selection of beautiful Japanese inspired artwork created by Hazle. 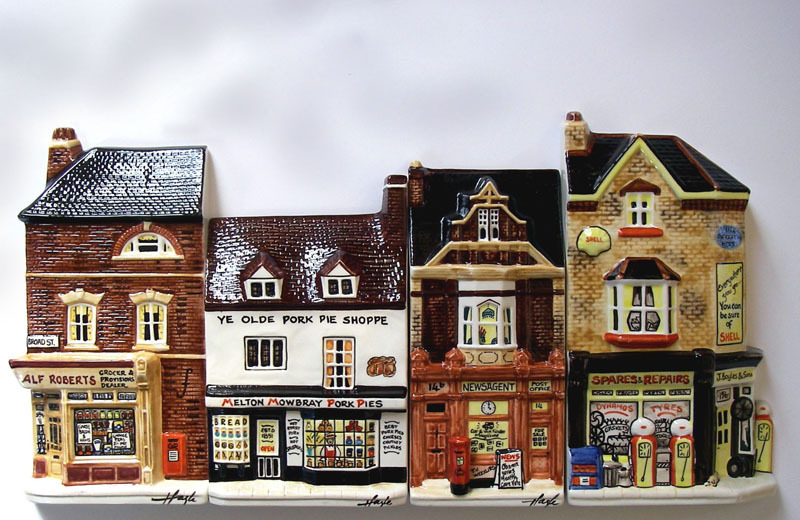 It all begins with the building…..
Often Hazle models a new building because our collectors have asked to have a certain shop or style of architecture added to the collection. Sometimes it is because as we retire buildings, we look at the collection and see a gap to fill. Hazle has such an eye for architecture that she has a constant list in her head of buildings she would like to model so despite the fact that modelling a new ceramic is very intense and tiring work, it is also the most enjoyable part of her role. Once the new building has been chosen, Hazle will visit to take photos and measurements, and to generally get the ‘feel’ of the building. 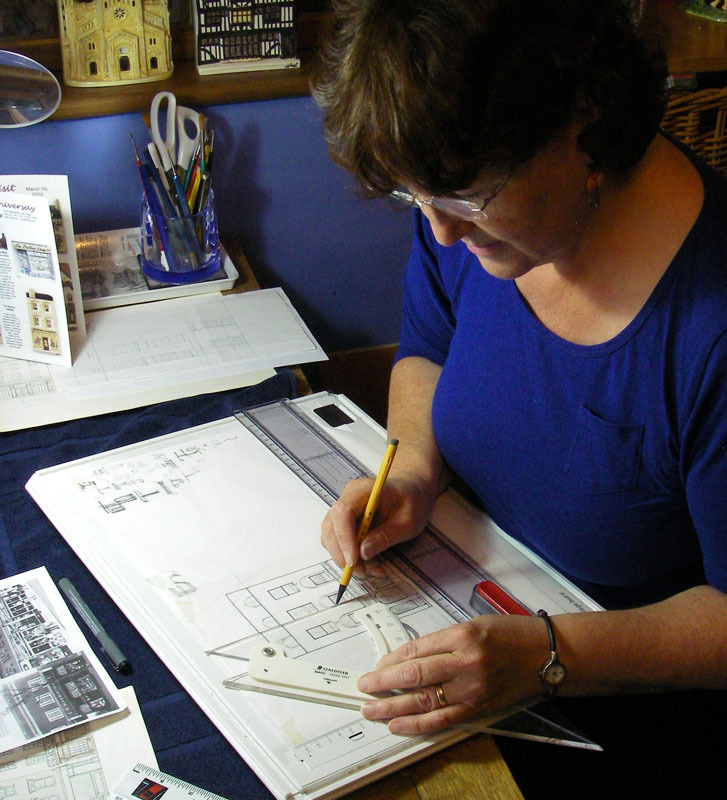 From these photos she prepares a detailed scale drawing – not on the computer, but using a drawing board, as you can see. These drawings are used as templates for the model. The clay is rolled out into thin slabs, cut to size using the templates, and built up, layer by layer to give the depth of the model. When the clay model is finished, it is used to cast a plaster ‘negative’. We use this to carve those fine details which are better done in reverse. 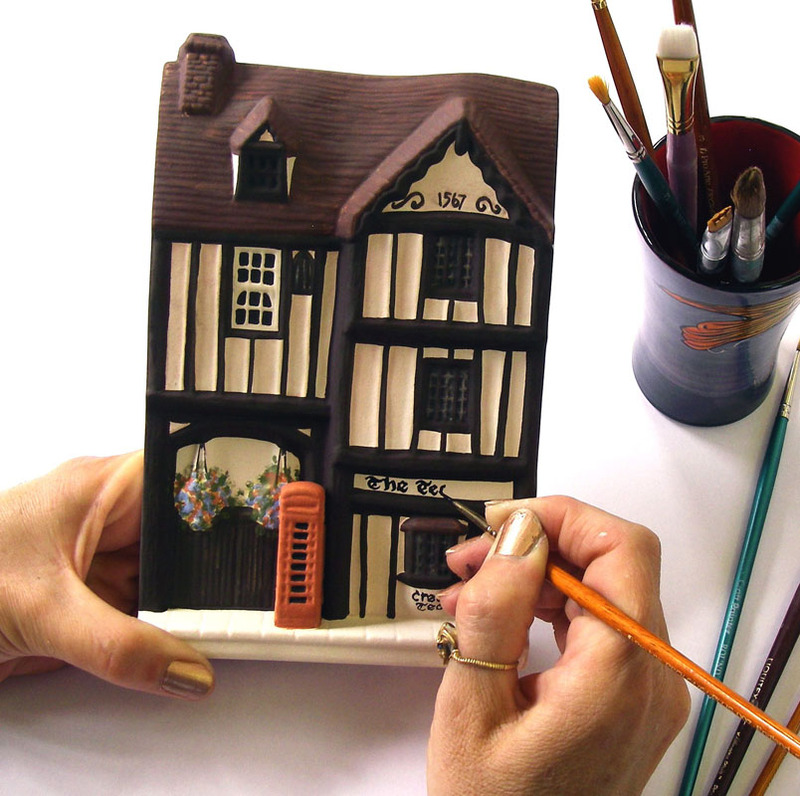 This is then cast again in plaster to give a ‘positive’ – an exact replica of the original clay model in plaster. Depending on the building, each model can be cast from positive to negative several times, refining and adding more detail at each stage, until we have a finished model. This model is then used to create a master mould. 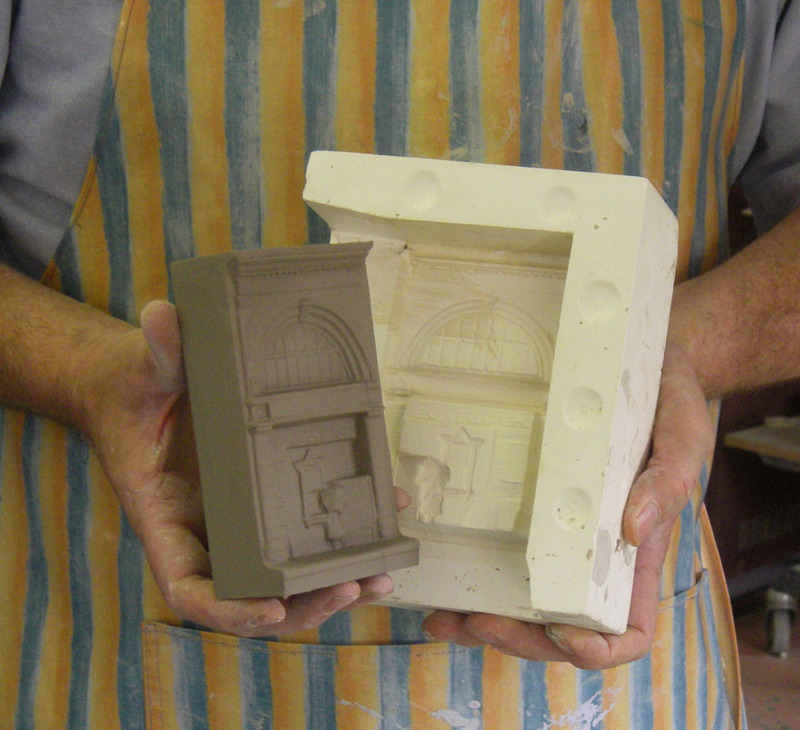 The master mould is precious as it is from this that all the working moulds we will use to cast the ceramics are made. 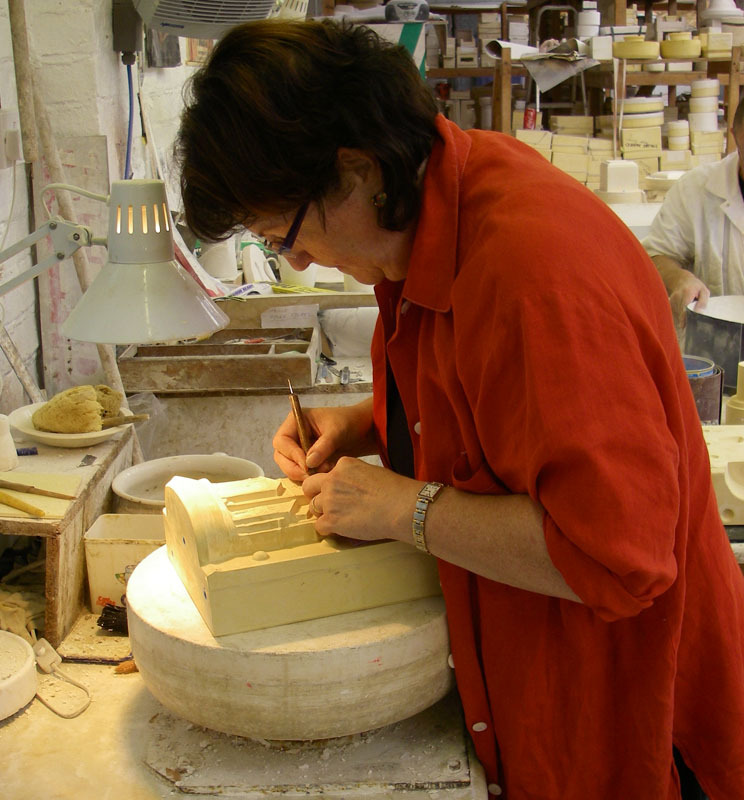 We cast a very few ceramics using the master mould, and use these to see if the master mould needs any further work, or has any faults. If so, Hazle will work on it and refine it before the working moulds are made. The working moulds are lined up, and ready to use for casting. 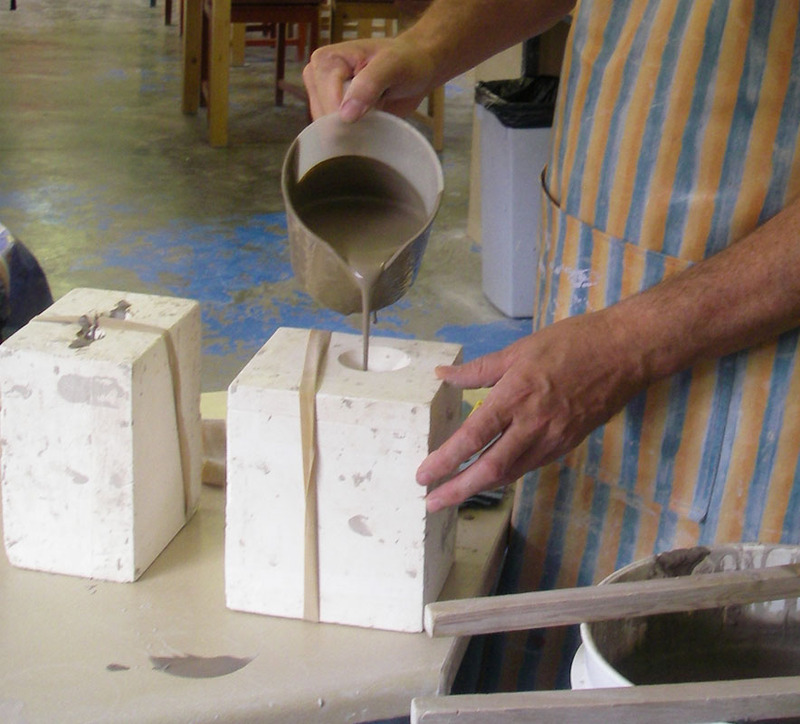 The slip is poured into each one until it is full, and left for a few minuets for the plaster to draw out the moisture from the slip, leaving a ceramic ‘shell’ inside the mould. The slip is then emptied out of the mould, and it is left aside for the ceramic inside to dry a little more. The mould is then opened and the ceramic, still slightly soft, is removed and left overnight to dry. 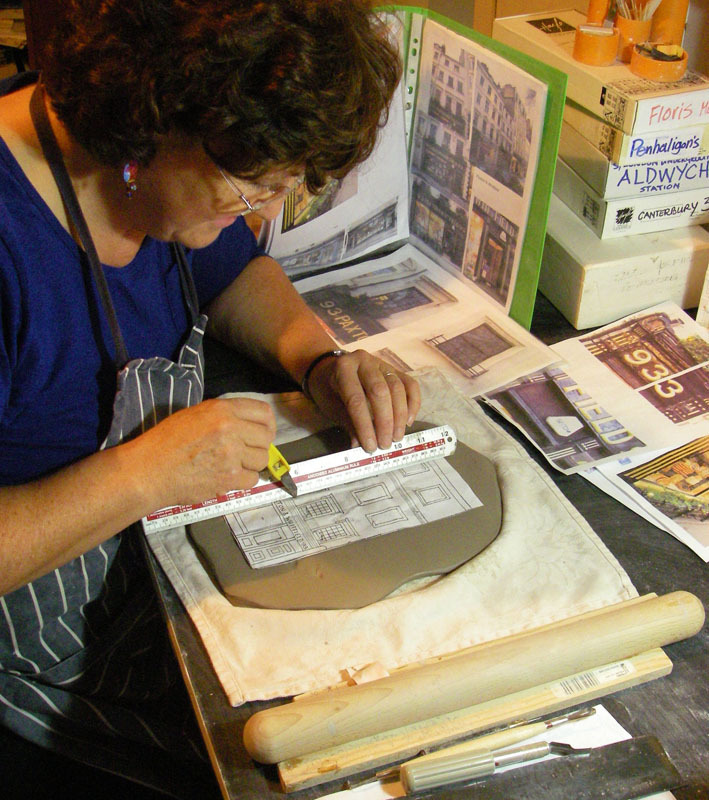 When dry the ceramic is fettled, which means removing any extra bits from the mould, and gently sponging over the edges and sides to give a perfectly finished product. The ceramics are then bisque fired. Once unloaded and checked, the ceramics are ready to paint, and will be distributed to our talented artists. Each time a new building joins the collection, Hazle organises a painting day, with herself and whichever artists will be painting it. The painted cermics are then checked ready for glazing. Hazle looks at each and every ceramic, she paints a lot of the lettering herself, and often adds extra details to the ceramics. The ceramics are then glazed. We spray the ceramics with a thin layer of glaze, which is literally liquid glass. When dry the glaze is checked, removed from the footrim of the reverse of the ceramic, and the ceramics are then loaded into the kiln. For some of our range, this is the final process, when they are unloaded they can be quality checked, labeled, boxed and sent out. Ceramics with gold on them must undergo one more firing. The gold lettering and detailing is painted on,usually by Hazle, using liquid 22 carat gold, and we load them into our ‘gold kiln’ for the final firing. The entire process is labour intensive, and takes skills which take many years to aquire. We pride ourselves on being one of the few ceramic manufacturers who still undertake the entire process here in Britain. The ‘ Hazle Team’ will readily tell you how proud we are of our shopfronts, that we love their individuality and quality, and hope that you will come to love them too.